Have you ever heard (or read) of Laurent Gbagbo? Maybe of Susilo Bambang Yudhoyono? or perhaps of Manmohan Singh? They are some of the top cited Heads of Government on the internet. Adding the citations of the all three politicians mentioned would total almost 15 million. A pretty number, isn’t it? 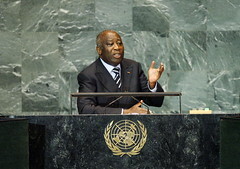 Gbagbo has been president of Ivory Coast since 2000 but his legitimacy is being disputed. Yudhoyono is a retired Indonesian Army general officer, and the current President of Indonesia. And Singh is the 14th and current Prime Minister of the Republic of India, the only Prime Minister since Jawaharlal Nehru to return to power after completing a full five-year term. Probably these are not the names that are most cited on the TV news in Europe or in America but definitely they are amongst the most cited on the net (mostly by media). As you might expect, Barack Obama, President of the United States of America, is by very far the champion of the champions in mentions on the net. More than 622 million citations, which is more than the top 100 current Heads of Government combined. Within this list, European politicians represent a total of 47 million citations with the Italian Prime Minister, Silvio Berlusconi ahead. Certainly he is probably being more cited because of his personal life than for his political activity. Overall, and once again, Europe is behind America. Last Wednesday, December 22, France urged its nationals in Ivory Coast (around 15,000) to leave the country, as a crisis over disputed elections (held on November 28, the second round of presidential elections) continued. The situation is getting worse over time and UN Secretary-General Ban Ki-moon has warned that it could evolve into civil war. The election contest was held between Laurent Gbagbo, first elected president in 2000 on a five-year mandate, and Alassane Ouattara, Prime Minister of Côte d’Ivoire from November 1990 to December 1993. The international community recognises his rival Alassane Ouattara as victor.